More than five years into the war in Syria it is not always easy for interested parties to get public opinion in the outside world to focus, yet again, on a conflict that can sometimes seem insoluble. For many watching from a distance, the shock value of reports about the aftermath of barrel bombs, suicide attacks, torture and starving civilians can diminish with repetition. One tactic that some Syrian activists are deploying to try to shortcut this is to tap into the global phenomenon that is Pokemon Go and to exploit it for all it's worth. Pikachus, squirtles and weedles and the other characters in the augmented reality game have been unofficially co-opted to highlight the harsh realities of war. This week the Revolutionary Forces of Syria Media Office - a group of media activists which supports groups opposed to President Assad's regime - has posted a series of photographs of children posing with drawings of Pokemon characters. The drawings are all captioned with a line identifying that the child is from a particular town or village in a rebel-held area in northwest Syria. The one in the image below reads: "I'm from Kafr Nabl in Idlib province. Come and save me." The circumstances in which the pictures were taken are not entirely clear. The RFS has not yet responded to a request for comment. But Kafr Nabl is a town which has a history of producing eye-catching banners to try to attract international attention, often appealing for Western military help against the Syrian government. The message behind the Pokemon portraits - which have been shared thousands of times on social media - seems to be: if you can spend so much time chasing fantastical imaginary creatures then why can't you do more for children growing up in a war. Artists outside the country have also borrowed Pokemon to make their point. The picture at the top of this article is by Moustafa Jano, a Syrian who now lives in Sweden. It's from a series that he has posted on Facebook, in which Pokemon is seen on the journey made by so many refugees who have fled the war and risked their lives at sea to face an uncertain future in Europe. In one of his posts, Jano quotes a line from the Swedish novelist Jonas Gardell: "Grandpa, what did you do that summer of 2016, when the world was on fire? Oh, dear grandchildren, we were looking for Pokemon Characters in the phone!" In Denmark, a Syrian graphic designer called Saif Tahhan has taken the game's distinctive player interface as his inspiration. He has produced scenes from an imaginary Syria Go game. Instead of searching for Pokemon, the quest is for security, education, medical supplies or some other essential resource in short supply for civilians caught up in the war. 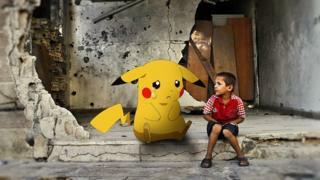 "I created these images as a way to turn attention to the Syrian cause and to focus on Syrian suffering instead of Pokémons (which people are crazy about NOW! )," he wrote in a message to Trending. "The idea got thousands of likes and shares, so I can say that people like this way of awareness and I hope they will react very soon in the real life." Next story: Hillary Clinton: "Secretary of the Status Quo"?